“Going to the gate, my heart was pounding again, and I had a lot of adrenaline. I’d forgotten about all that. It was really exciting,” Sutherland says of her return. Just over two years after she announced her retirement from race riding, Chantal Sutherland is back in the starting gates and approaching a personal milestone of 1,000 career victories in the United States and Canada. Sutherland, 40, announced her return to full-time riding one year ago, in December 2015. The rider told The Guardian last year she was sour and frustrated when she first left the saddle in 2012. She returned briefly but hung up her tack again in summer 2014. This time, she said, she's back for good, after thoughtful consideration. Besides taking a break from the saddle, Sutherland originally thought of her departure as a chance to transition into a more domestic lifestyle. She married meat processing plant owner Dan Kruse in 2012 and anticipated settling into a 9-to-5 type of job, but the relationship crumbled and Sutherland found herself restless in the walls of a cubicle in a traditional office. “I thought I wanted to retire and be married and try being a wife,” she said. “I took an interior design course and did real estate. I did that, but I wasn't totally fulfilled. There was something still missing. Being married was good for a few years and got a little rocky. Now, Sutherland believes she has returned home. She felt an initial hesitation from trainers to give her another shot, and she suspected they were waiting to see how serious she was about her career. 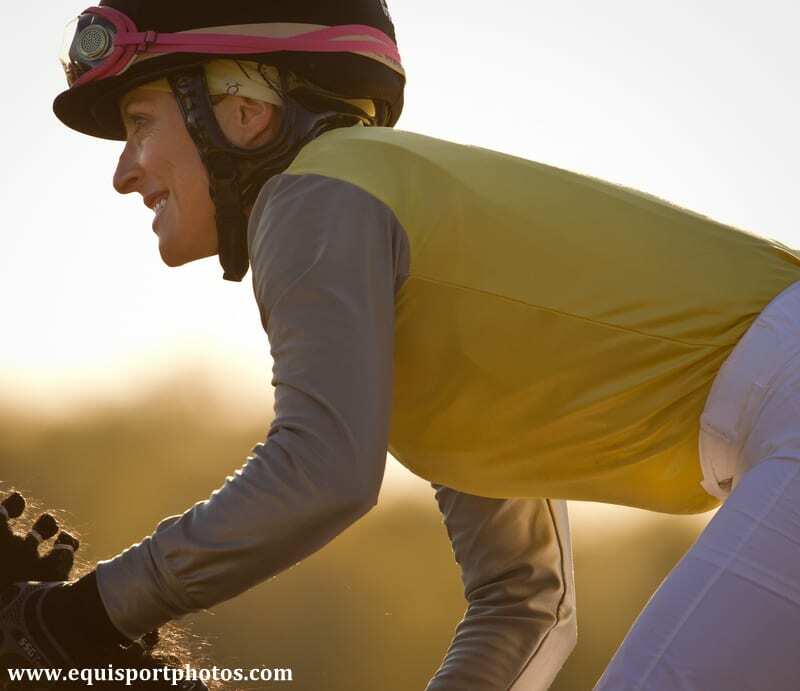 One year in, Sutherland said she's getting the support she needs to ride in one of the country's most competitive jockey colonies. Although she didn't have a mount in this year's Breeders' Cup, she did work John Shirreffs trainee Gormley into his Juvenile bid, and her afternoon assignments have picked up through the fall. As the year draws to a close, she has 14 wins from 140 starts and has hit the board 44 times for a 31 percent average. Physically, Sutherland said the return to race riding wasn't as challenging as it could have been because she kept fit throughout her layoffs. Her regime, whether she's riding or not, includes running, yoga, and a combination of indoor cycling classes. Of course, nothing can replace riding a live horse, and she admitted to some body-soreness for the first week of her return to the saddle. She has also had to watch her diet, which she had to keep light when she wasn't riding. Now that she's in heavier work, she's happy to find she can eat more than she used to. The track is also where Sutherland said she feels most like herself, and it's a good place to remind her of two of the biggest parts of her upbringing: horses and the fire of competition. Sutherland grew up on a farm and was a field hockey player, following in the footsteps of her parents, who were competitive athletes in school and as adults. She shifted her focus to Thoroughbreds in high school and college and eventually cold-called Hall of Fame rider Angel Cordero, asking if she could train with him. After a year under his tutelage in Florida, she started her career in Canada and won two Sovereign Awards for outstanding apprentice jockey in 2001 and 2002. She has been aboard graded stakes winners Mine That Bird, Great Hot (BRZ), and most famously, Game On Dude, who made her the first female rider to win the G1 Santa Anita Handicap and G1 Hollywood Gold Cup. Mentally, the sports-minded Sutherland said there was no hesitation when she re-entered the gates for the beginning of her most recent comeback. Sutherland has no timeline for her riding career at this point, but part of what drove her to come back was the knowledge she likely won't be able to ride races indefinitely. For now, she'll take things one step at a time. This entry was posted in Lost And Found and tagged Chantal Sutherland, Horse Racing, Jockeys, Lost And Found, Natalie Voss, thoroughbred racing by Natalie Voss. Bookmark the permalink.